Sure, but we have been receiving green ones to fill out for the longest time, and now there are reports of white forms. Was it just the the colour that changed, and both green and white forms are identical in content and format? Like others I have never filled one out in a totally alert state... I am tempted to say the white form asks for additional personal information (address, that sort of thing) but is otherwise identical. 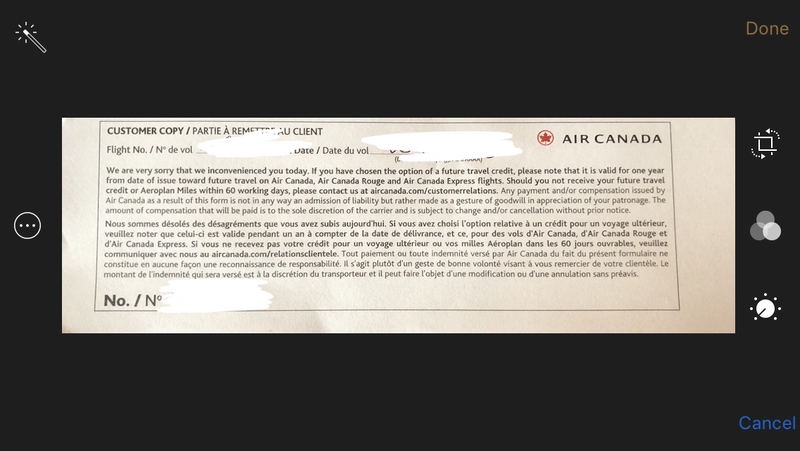 I actually keep pictures of previous compensation forms on my phone for evidence as the little "receipt" given is only a reference number and has no relevant information about the problem on it; you are at the mercy of the SD submitting that form in order for your claim to be processed. I always do the same thing. And it has been useful once. So then what did the SD say when s/he handed you the white claim form despite being told it is done on the iPad? Also, did you have to fill out the white form? 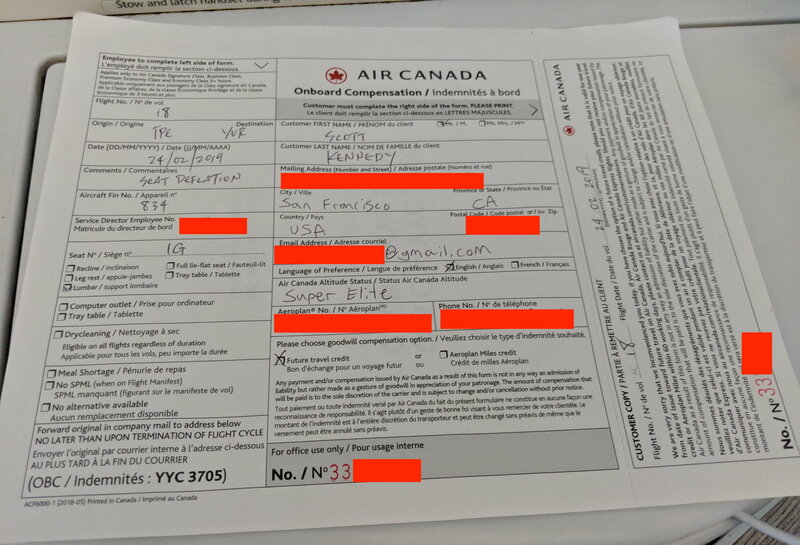 Seat no., flight no., select specific issue from a bunch of checkboxed items, describe the specific issue with a short couple of sentences, etc.? Was there a detachable portion like on the green forms with a reference no. to keep as your "receipt"? Thanks. Maybe AC ran out of green paper or didn't like their green paper supplier. On one leg I was on an A330 with the old seats. I love those seats! So I got chatting with an FA, and she told me something that sounded reasonable and I had not heard before. She claimed that the reason for all the failures is that passengers, and even some crew, try to lift the cushions off the frame, and in doing so pull on the valve attachment and damage it. Sounds plausible, but if true the solution is not only technical but also needs some education and commnication to crew and PAX. So I got chatting with an FA, and she told me something that sounded reasonable and I had not heard before. She claimed that the reason for all the failures is that passengers, and even some crew, try to lift the cushions off the frame, and in doing so pull on the valve attachment and damage it. Did she suggest why they would do that? I've certainly never felt a temptation to do so. Good question. She didn’t but perhaps there’s people who drop something in the folds of the seat, or they’re checking at end of flight they aren’t leaving something behind... what sounded plausible was the fact that other than manufacturing defects there is really no reason for the valve attachments to fail so frequently. Actually, unfortunately, her statement is false. The problem is a manufacturer's defect in a plastic weld. The manufacturer had to redesign the bladder, certify it, and get it into service. AC is now replacing them. Fair enough. Hopefully the redesigned bladder is a multi-compartment design. Kind of like the Titanic? visitor, capedreamer, gabdusch and 3 others like this. Wow, just making .... up. I have no idea why anyone would try to do the thing she said was causing the problem. Ridiculous.